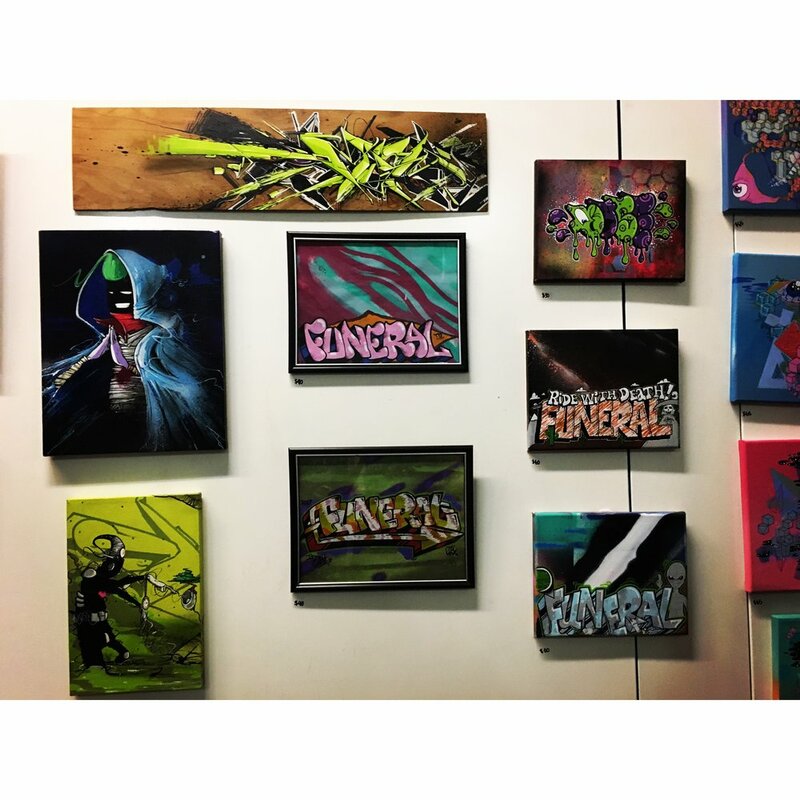 A group of dedicated street artists just pulled off what might be the largest sticker art installation show in the United States – Sticker Nerds III. After months of preparation and stickers donated from around the world, a simple warehouse space was transformed into an alternate reality. Every wall and fixture covered with an estimated 15,000+ pieces of artistic expression from 1000s of artists around the world. Each sticker telling a story, a small glimpse into someone’s unique personality and imagination. 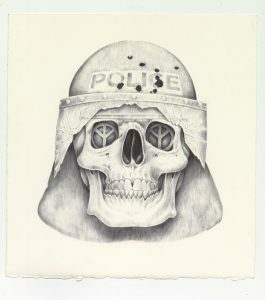 The third and largest installment of the Sticker Nerds trilogy was carried out by a team of about 20 prolific vinyl sticker artists and supporters including: Skam, RxSkulls, Kanye, Doctor Rasterbator, Voxx Romana, and Jonathan Boys. 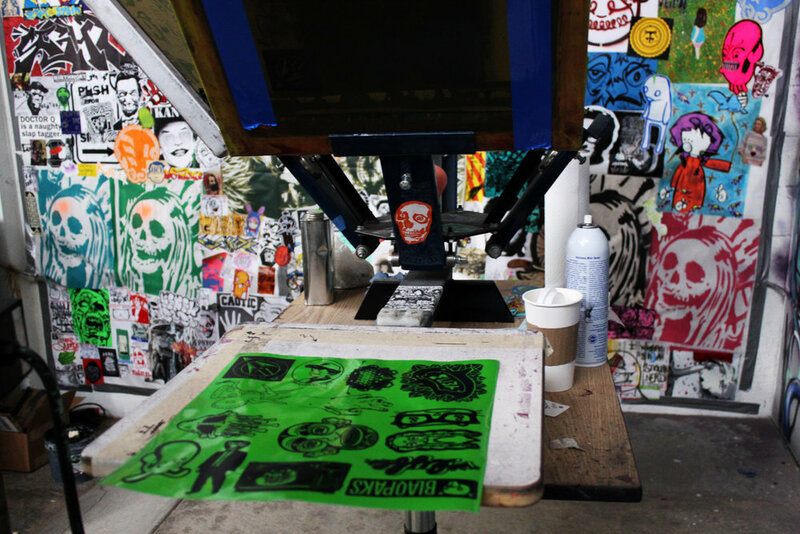 Over the past 10 years, the Portland sticker art scene has blossomed into an impressive, colorful, and relentless force on city streets. To the dismay of tireless graffiti abatement crews, volunteer community groups, and vigilantes, stickers just keep getting up – an endless cycle of slap, stick, and scrape. Many sticker connoisseurs would agree that Portland is one of the best places to see this type of urban intervention. 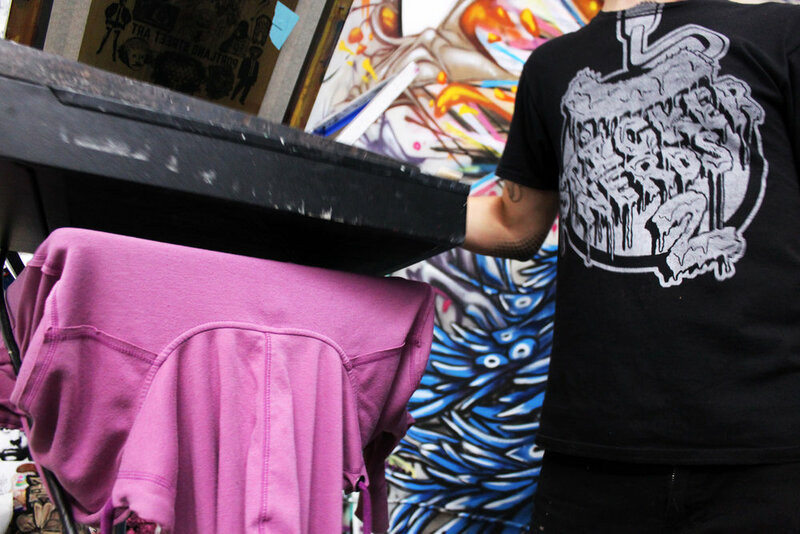 Some say Portland’s wet weather and mural regulations have encouraged artists to focus more on vinyl mediums, others look back to our DIY and skateboarding cultural roots. Regardless, a strong and supportive community of artists has formed, all helping each other master this craft, push its limits, and organized for the cause. Tension and nerves were high before the show. Logistically everything was working great, however, organizers ran into red tape when it came time to obtain an event permit from the Portland Fire Marshal. 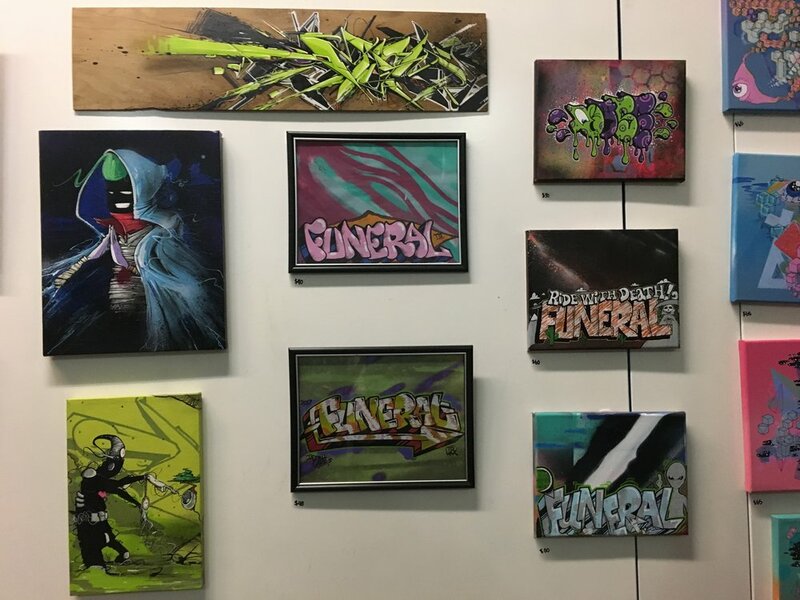 The City’s Fire & Rescue office and the Portland Police have come under scrutiny in recent weeks for allegedly paying extra attention to enforcing capacity codes and shutting down local cultural events like hip hop concerts, art gallery events, and dancing events. Even though Sticker Nerds III venue was a big space, it only had one exit. After days of talking with marshal’s staff, the organizers were forced to limit the event to no more than 25 people at any time. Three people were needed to manage the space, leaving only 22 spaces for visitors. To accommodate for this unfortunate, but understandable limitation, the event was quickly reconfigured into an all-day open house. On the morning of the show, a message was posted by organizers with the warehouse’s address and a note “Please be advised that you may have to wait in line. Please respect the local neighborhood. 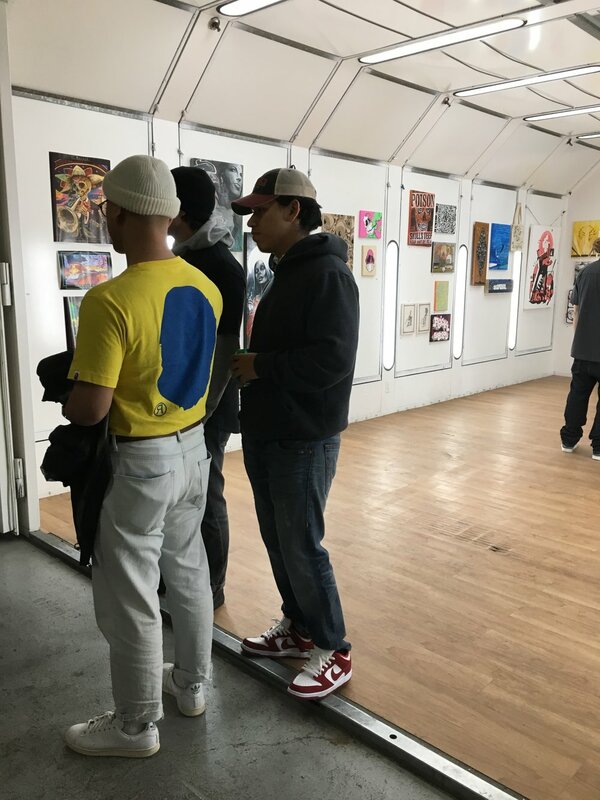 The Sticker Nerds 3 event does not condone vandalism.”Within minutes of posting the location on various social media outlets, people started lining up outside the door hoping to be one of the first 100 guests in who received a special SN3 sticker pack. Sticker enthusiasts from as far away as Minnesota, California, and Washington came to Portland for this free event. The line remained 1 to 2 hours strong all day and night. Once in possession of the doorman’s magic glass ticket, guests entered the warehouse. You were instantly submerged in a sea of stickers and wheatpastes. 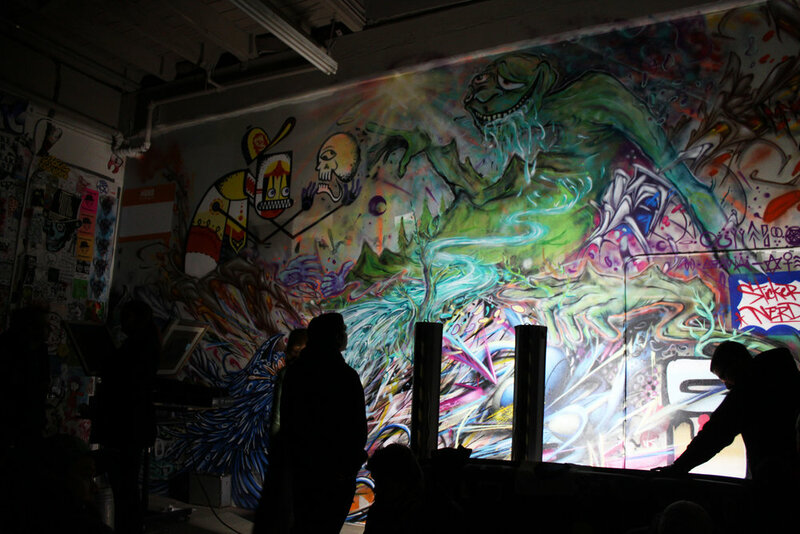 Static-crackling TVs, light projections, and DJs gave it a post-apocalyptic vibe. The artists even incorporated real pieces of everyday life into the space like city furniture, utility boxes, newspaper boxes, bathroom stalls, espresso makers, and a few classic tube televisions. 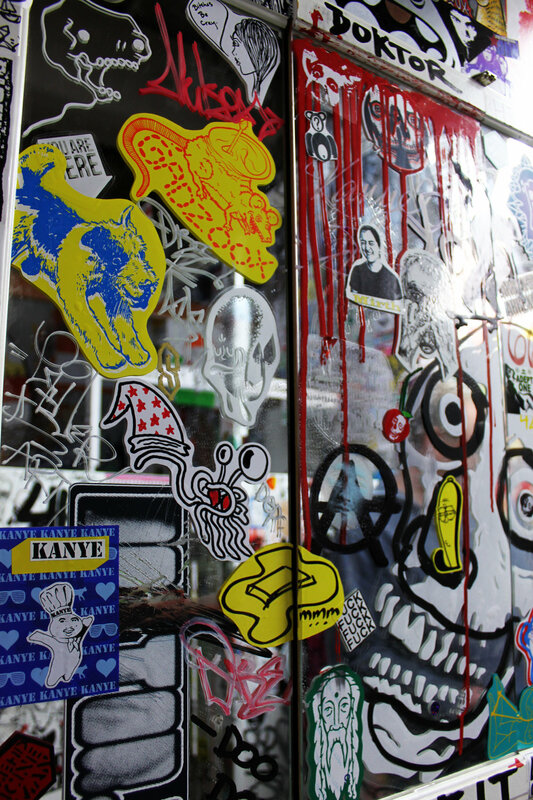 The walls constantly change throughout the day as guests added more stickers and tags. 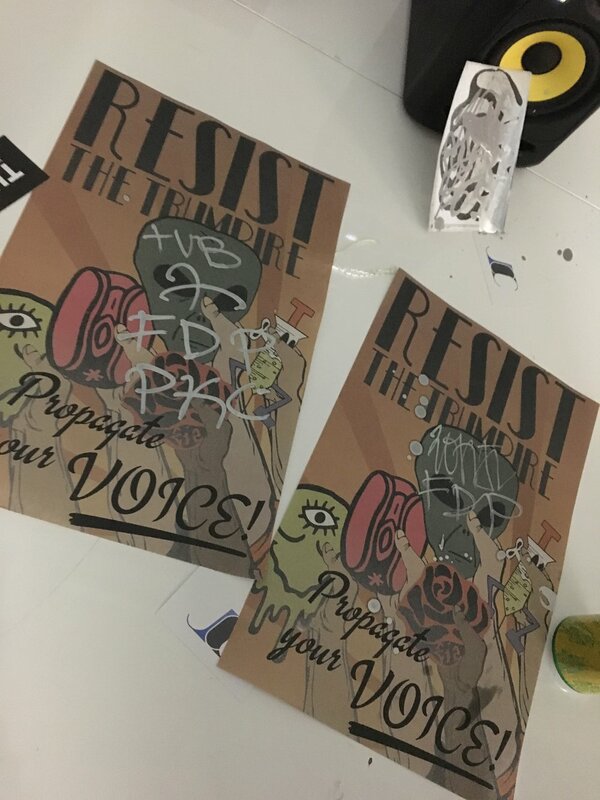 Outside the venue, an art-covered newspaper box was used by attendees to share stickers and swag. 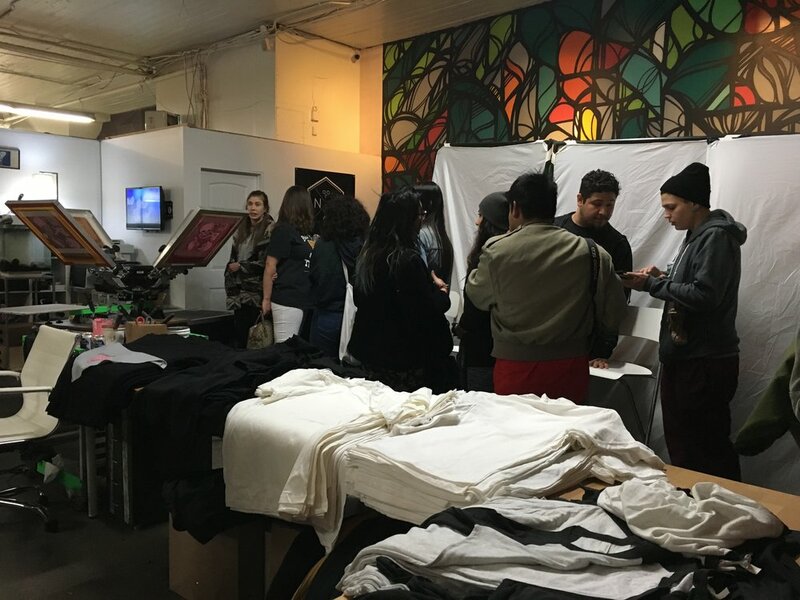 A full screen-printing set-up cranked out fresh prints on bought or brought clothes, a gallery sold handmade fine art pieces, and pop-up shop sold merchandise like prints, stickers, tee-shirts, bike bags, books, bandanas, cozies, patches, and buttons. Local street and graffiti artists painted a full wall collaborative mural, displaying some of Portland’s finest artistic talent. Throughout the day, free art was given away to guests. The day after the show, an all-warehouse auction was held. They even sold the wall panels to raise money for the next event. Since they had to officially close their doors at 9pm, organizers threw a special SN3 VIP After-Party. Guests with exclusive stick-its quietly descended upon the dimly lit warehouse for evening of networking, creating, trading, and conversing. The evening closed without incident, everyone played by the rules. Most of us left with pockets full of stickers and an amazing sense of community. Portland’s sticker art scene is as much about the art as it is the people who do it and the social spaces it adheres too.